Giants of recent glory years are even better people than they are players, General Manager Brian Sabean says. That’s certainly true of Brian Wilson, the newest former Giant, who was, and is, far more than the bearded eccentric that the media adores. Giants fans will rightly remember Wilson for his unprecedented accomplishments on the field. Even before the three-time All Star closed the last game of the 2010 World Series, setting off the happiest delirium in team history, Wilson already did as much as any other player to propel the Giants to their first championship in San Francisco. His 48 saves that season tied a team record and he threw the team on his back in the playoffs against the Braves and Phillies, earning five saves and a win with a perfect ERA of 0.0. Wilson’s amusing eccentricity won’t soon be forgotten either. The long black beard was just the beginning. Wilson also sported a blonde Mohawk, popularized the spandex tuxedo, flashed a crazy stare in team photos and perfected the oddball quote. 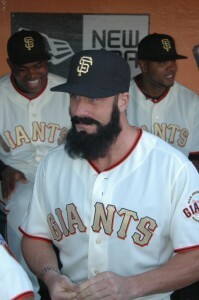 Hey “Willie,” what do you think about that Brian Wilson gnome giveaway? “I don’t gnome what you’re talking about,” replied the Giant. I’m going to remember him for other reasons, though. For instance, among his many unique attributes, Wilson is the only big league ballplayer to ever pour me a beer. Though I spend most of my time teaching, I also enjoy writing and I’ve been fortunate enough to interview about 100 major league players over the last ten years. Some players, particularly the stars, are understandably tired of media requests and don’t always want to give their time to writers they don’t know. In his heyday, the Giants had no bigger star than their closer Wilson. Yet he was cordial and approachable to me every time I met him, first at a charity event to benefit wounded veterans where he served as a celebrity bartender and later in several clubhouse interviews. He liked praising teammates far better than talking about himself. Wilson’s zany personality could make him seem like a glory hound, but actually he’s as humble as they come. For example, the fireman made a crossed-arms gesture after saving a game that some misconstrued as self-aggrandizement. Actually, Wilson’s motion honors his deceased father and the God of his Christian faith. As seriously as he committed to the team, pushing himself to the limit in legendary workouts, Wilson committed equally to the community. He gave his time and money to the Junior Giants, buying more than 1,000 gloves for needy young players, established a scholarship for Air Force cadets in his father’s name and performed in a music video with a sick youth to cheer and support him. Wilson contributed to the MS Society, the Special Olympics, the UCSF Children’s Hospital, breast cancer research and many other causes. 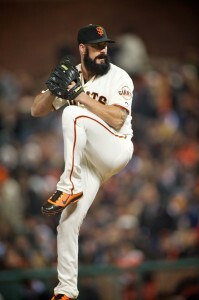 Wilson required “Tommy John” surgery to repair his pitching elbow this year and missed most of the 2012 season. With his recovery uncertain, the Giants chose to release him rather than commit to a multi-million dollar contract for 2013. Many fans would like to keep him, though we often lack objectivity and perspective on such matters. If I had my way, for instance, the Giants might still have Jack Clark, Matt Williams and Juan Uribe. Cutting “The Beard” is probably the right baseball decision. So this fan and occasional writer says goodbye and wishes him well. Thanks, Willie, and not just for the baseball.